The BT-5 mod. 1933 is a Soviet reserve Rank I light tank with a battle rating of 1.0. It was introduced in Update 1.45 "Steel Generals". It is a very fast tank with a heavy-hitting 45 mm gun, but at the cost of lighter armour. This tank is quite unique. It has virtually no armour, weights only 11,5 tons and has a massive 400 HP engine (442 HP fully upgraded), giving it up to 38 HP/Ton ratio. This paired with excellent Christie suspension allows it to drive like a race car among tanks. Gun is an adequate 45mm 20-K cannon with decent penetration and quick reload. 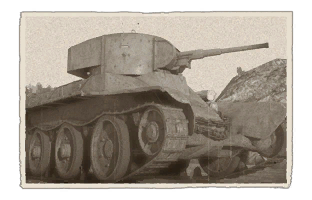 The BT-5, as with most light tanks in-game, are fast, but at the cost of having little armor. This makes the BT-5 an ideal flanker. The primary (safe) tactic would be to shoot and scoot, never stay in the same place for long. The less safe route would be to run rings around the enemy and take shots while circling them. Overall, the rule with the BT-5 is: shoot the enemy first; if they try to shoot, don't get hit. Tracks and suspension wheel are both 15 mm thick. Best tactics is probably however to not charge right into the combat, but wait a while to see how the battle develops - observe where and how many enemy tanks go, maybe fire a few shots from the distance. Use the BT's great mobility to get to the best positions. And then use its awesome speed to charge at lonely opponents, which at close range have no chance of keeping their guns from tracking the BT. Keep in mind that charging into more than 1 opponent is usually a quick end, as it is very hard to not get hit from either of them at the same time. There is no armour on BT-5 to stop anything other than machine gun fire. Finally, try to avoid AA vehicles, as they will have no problem targeting and shredding the BT with rapid fire, even from the distance. Very vulnerable to quick-firing auto-cannons like Pz.II's or AA vehicle's. One shot in the front will knock out the crew. The BT, or Bystrokhodny tank (Fast tank), was a strange combination of national engineering. The BT's origin lays with an American automotive designer named Walter Christie, who developed a suspension system that can be converted between tracked and wheeled travel. His first attempt was the M1919 tank and submitted in February 1921, but was withdrawn for improvements in Spring 1921. It was rebuilt as the M1921 and tested until May 1923. While his design had garnered interest, the deficiency of the cramped crew compartment and unreliable had the design rejected in July 1924. Christie improved the suspension again and patented the design in April 1928. The new suspension used large road wheels with smaller idler and drive sprocket, with a chain to drive the vehicle track-less when needed. The suspension wheels were supported by large springs in the hull to provide a relatively smooth ride compared to the usual suspension design of the day. This design, today known as the Christie Suspension, was put onto the M1928 tank and presented on October 1928, with a public demonstration by driving the tank from Maryland to Pennsylvania on an average 28 mph speed. The attention grabbed overseas interest, one was the Polish Army, but another country interested in the design was the Soviet Union. The Soviet Union, using their ties with Amtorg Corporation in New York, offered to buy the M1928 design and its license production rights. The deal was done on 30 April 1930 with two M1928 tanks for $60,000 and the production rights for $100,000. The tanks that arrived at the Soviet Union were designated the M1940 convertible tank. Polish interest in the vehicle vanished upon learning of the transaction with the Soviet Union. However, while Soviet Union was aware of Polish interest in the vehicle, they did not hear of the cancellation and made estimations that Poland could have up to 100 Christie tanks with 300 Vickers tank by 1931, prompting a hasty production schedule of their own tank designs. Though with flaws, the M1940 was accepted for production in 23 May 1931 as the BT-2. Manufacturing difficulties led to delay in the production tables of the BT-2. Another issue was the choice of armament,with the Red Army jumping from the 37 mm PS-2 gun derived from the French Hotchkiss gun, the 37 mm Pak 36 developed by Germany, then the 45 mm. 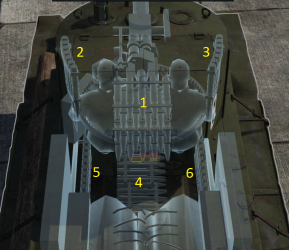 The changes in armament, each larger than the other, created fitting issues with the BT-2 turret design. 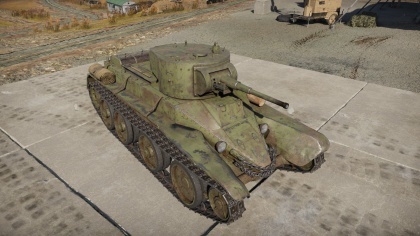 Despite 620 units produced by 1944, the BT-2 was deemed near useless except for practice. An improvement was needed for the service of the Red Army. The BT-2 design was improved at the KB-T2K tank bureau, with BT-3 being a measurement conversion from imperial to metric, and the BT-4 changing the rivet construction with welds. In 1932, the plan was to upgrade the BT-2 and equip it with the 45 mm. The next iteration, the BT-5, was completed in 21 October 1932 without a turret, though with the complete model made in 01 January 1933. The most notable change between the BT-2 design and the BT-5 was the enlarged turret for the 45 mm gun with a coaxial machine gun. Most BT-5 were equipped with the M-5 Liberty gasoline engine, but some equipped with the BD-2 diesel engine were designated the BT-5diz. A total of 1,946 BT-5 were produced during its production life between 1933 and 1934. Aside from the tank model, many different variants were produced on the BT-5 design. Such as the BT-5PKh designed for deep-wading, the RBT-5 that equipped two 250 kg 305 mm Tverskiy “Tank Torpedoes” on the turret, a BT-5 with two Katyusha launch rails, the KhBT-5 with a KS-34 flamethrower, and the SBT-5 bridge-layer engineer vehicle. All were built with varying levels of success and practicality, only the SBT-5 were made in noticeable numbers, of which was five units. The BT-5 were first used to equip the 5th Kalinovskiy Mechanized Corps. 325 BT-5 were equipped with the 71-TK Shakal radio transceiver, designated the BT-5RT. Tanks without radio had to communicate via signal flags, hand signals, or by flare. The Soviet’s first usage with the BT tanks was in the border conflicts with Japan at Khalkin Gol. At this point, the BT-7 was starting to succeed the BT-5 in Red Army service, but the BT-5 still served in the 11th Tank Brigade in three battalions. Though the BT were successful in stopping Japanese advances and driving them back, the BT tanks suffered casualties under the 37 mm anti-tank guns and 70 mm field guns in Japanese service. While experience with the BTs were still satisfactory, the fighting revealed flaws in the design. The BT armour was becoming too thin to resist standard anti-tank weaponry, radio sets were too easily damaged, rubber on the wheels would melt off in prolonged march in hot weather, and the tank’s petrol were catching fire due to combat damages, leading to a change in Soviet power design from petrol engines to diesel. The BT-5 also saw use during the Soviet’s invasion of Poland in 1939, with only 147 BT-2 and BT-5 in four tank regiments but these did not see much combat. A number were also used in the Winter War against Finland in 1940. In April 1941, months before the German’s Operation Barbarossa, the Soviets still had 1,658 BT-5 of all variants in inventory, but wear and tear had begun taking their toll on their reliability. Mechanical problems became rampant and when the Germans invaded Russia on 22 June 1941, many BT tanks were lost from breakdowns. Those that were able to encounter the German Panzer divisions were clearly outmatched by the Panzer III and Panzer IV. They were only a match against light tanks like the Panzer 38(t), but the German’s more experienced tank formations were able to win even when outnumbered. The drastically reduced BT tank numbers meant they were almost a rarity past 1941. In the Summer 1942 fronts, there were only 65 BT tanks fighting the Germans. By June 1945, only 299 BT tanks were still available in all parts of the European theater. The BT’s last major campaign was in Manchuria during the Soviet’s offensive against Japan. Though majorly BT-7s, 190 BT-5s were present by September 1945. In 1946, all BT tanks were retired from Soviet service. This page was last edited on 4 January 2019, at 03:49.